Welcome to this cute and super chic condo in Hampton Village. STOP PAYING RENT! This condo will allow you to reduce your monthly costs AND get into home ownership. 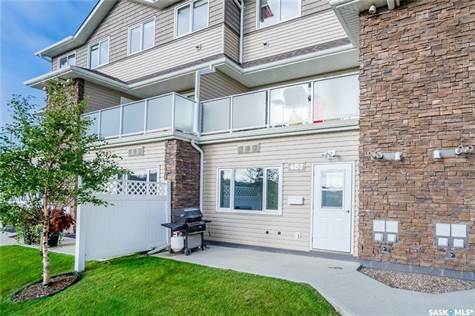 Start building equity.\r\n\r\nLocated in Hampton Village this unit offers easy access in and out of the neighbourhood. Overlooking the park and trail network, with direct access to a private yard its like living in a house... but without the maintenance. Oh and what a VIEW! !\r\n\r\nInside is a very clean, bright and trendy unit. Lots of cool features such as upgraded lighting, new laminate flooring, paint, feature walls and custom tiled back splash.\r\n\r\nAdditional features such as loads of storage in your clean dry concrete crawl space. Brand new A/C unit. All appliances and window coverings and 1 parking stall right outside your window.\r\n\r\nInterest rate are low, and rent is high...Now is the time to BUY! Motivated Seller. Don't delay...Call today.